There are many different string trimmers available on the market; however, we decided to present you Troy-Bilt string trimmers and to provide you all relevant information that you need in order to understand its features and capabilities. Typically, if you want more powered string trimmers, than you should purchase gas-powered, however, for general households you can choose electric trimmers that are easier to maneuver and great for lighter-duty tasks. Technology has brought us to times where battery powered string trimmers are nearly equal to gas trimmers, however, they are more expensive, but you will be able to engage in whatever job that you want to do without any additional problem. There are different features that could help you determine what kind of string trimmer you need. That includes trimmer engine, cutting head and shaft that you prefer to use. Troy-Bilt developed 2-cycle string trimmers and 4-cycle string trimmers. 2-cycle string trimmers will deliver you plenty of power for cutting through tall weeds and grass; however, they require gas and oil to be mixed with fuel. 4-cycle string trimmers have more efficient and powerful engines that have the possibility to slice through thick and tall grass with ease. These engines eliminate need to mix gas and oil and they function just with fuel. Straight shaft string trimmers have straight and longer boom that makes it simple to trim hard-to-reach places and that makes them ideal for yard filled with bushes, shrubs, and ditches. Curved shaft trimmers are pretty comfortable and ergonomic and they are specifically made to give you the possibility to use them for longer periods of time. They are perfect for trimming around sidewalks, flower beds and for yards that are large and flat. If you have a long and tiresome job ahead of you, a Troy-Bilt string trimmer is a perfect choice that will help you clear away annoying grass and weeds. You can also add an attachment that can transform this great lawn care tool in versatile string trimmer that allows you to sweep away debris, trim hedges and to cultivate the soil. This particular string trimmer contains adjustable handle and easy-to-find controls and one of the best features is large and useful 17-inch cutting radius, which means that you don’t have to frequently go back and forth in order to mow the same area. This is a great timesaver and the main reason for its popularity. It contains debris shield that will prevent any pieces of vegetation from flying all over and ending on your clothes and face. You can extend it easily just bump the head on the ground and that will produce an additional string that you need in order to cut through the tall grass. We can say that it lacks anti-vibration features; however, it produces a mild vibration that could interfere with your overall health in case that you work for a long time. The problem is because vibration could cause muscle strain and fatigue and in some cases permanent damage but just if you use it extensively for a longer period of time. When you decide to purchase this amazing Troy-Bilt string trimmer, you will get industry standard warranty which is two years for the drive shaft and two years for labor and parts. There is also an online manual that you should check if you get any kind of problem or if you need any assistance. However, if that doesn’t solve the problem, it is always better to call the manufacturer for standard service. It doesn’t contain email support. This particular 4-cycle trimmer is powered by a 29cc engine and it contains amazing cutting abilities and all thanks to .095 inches line that features in bump head. 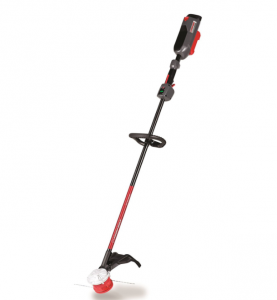 This Troy-Bilt string trimmer is considered as one of the best string trimmers available and according to a wide array of customers, we can see all over the web positive reviews and comments. It contains wide cutting swath so it will be easy to finish your lawn because it contains 17-inch cutting swath. That is a perfect feature that will allow you to cut everything around you perfectly without returning to the same spot. With convenient loading system, you can easily change the line and have a quick operation without losing additional time. Adjustable handle will help you boast a multi-position handle that could be adjusted so that you can use it to the right or left hand without any problem. That is a great feature if you have in mind that trimming could be difficult after a while and at the job where every second count, you can rest assured because Troy-Bilt string trimmer will help you finish your job in a timely manner. You can add series of attachment that could transform trimmer into another tool that could be useful too. Just obtain different attachments and you will get a versatile trimmer that could help you do whatever you want in your garden. It comes with 2-year warranty, which is great if you have in mind that you will get a high-quality trimmer that will never disappoint you. However, if that happens, just call the manufacturer and everything will be solved in a matter of days. 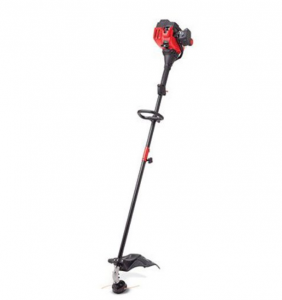 Troy-Bilt TB22 string trimmer is perfect tool that will keep your garden beautiful. It contains resilient 25cc 2-cycle engine that has a possibility to help you boost your power through yard work. The engine contains SpringAssist technology that makes it easy and capable of cutting even tallest grass efficiently and quickly. The engine also contains JumpStart which is a great feature that eliminates the need to pull any cord. It helps you tackle through toughest challenges that can happen. You can add a different attachment that will make your Troy-Bilt string trimmer professional tool for gardening jobs. You can make it into edger, blower and there is much more attachment that you can choose in order to make it more efficient. SpeedSpool 2 makes the bump head loading line easier and faster, and everything is in order to reach easier cutting moment. Curved shaft design is something that makes it comfortable so that you can have a direct view what you are cutting. In the same time, it contains comfortable handle grip for an easier operation that will reduce operator fatigue and vibration while working. 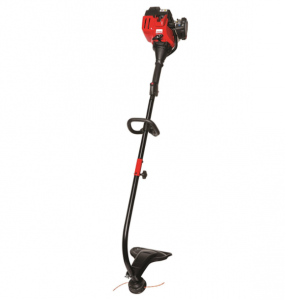 This amazing Troy-Bilt string trimmer contains 40V power cell that is very convenient if you have in mind that you can charge without any additional problem. Even though it is pretty heavy and it could interfere with your carrying possibilities, after all with all its powerful features, you can handle big yard in a matter of minutes. With CORE technology the engine design provides maximum torque so you don’t have to use gas in order to make it work. The battery is 40-volt Lithium-ion and it is capable of providing great runtime and performance, which is equipped with boost mode that will give you the possibility to accomplish all tasks in a timely manner. It contains multi-position over mold that allows you to handle it with full support and comfort. Ergonomic grip is the reason for its popularity because it is at the same time efficient and comfortable for enduring the toughest outdoor challenges. Power output display mode will allow you to manage run-time and monitor its performance in real time. This is a great feature if you have in mind that you must be certain how much time you have to finish. The organization is better when the display is transparent. It comes with 2-year warranty and lifelong warranty for the engine. CORE technology provides maximum torque for toughest challenges such as tall and thick grass. If you want to cut down tall grass and dense brush with minimal effort, this is amazing Troy-Bilt string trimmer available on the market. There are many different features that make it an important part of your household. The engine is detachable and it can be used to power other attachments such as pole saw from the same manufacturer. This is a great way of preserving and sharing the same engine with other products from Troy-Bilt. If you have a similar product, you can purchase this particular string trimmer without an engine for a cheaper price. The engine is capable of powering 10 different Troy-Bilt products, so when you purchase this string trimmer, you can buy the next product without an engine for an affordable price. It comes with a 27cc 2-cycle full crank engine that gives very little vibration and longevity. It is very easy to start because it contains JumpStart Technology that allows you to initiate motor without pulling the cord, which is far better because you will lose less time. You can also use SpringAssist that will help you pull the string much easier and that is the reason why people are amazed at it. 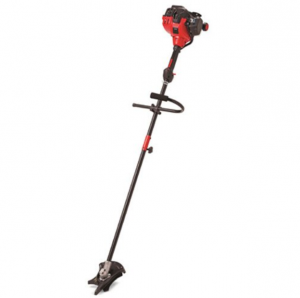 You will get this string trimmer with a straight shaft which is specifically made for bushes and shrubs. With high strength four tip steel blade, you can deal with the thickest bush without any additional problem. However, it weighs 14 pounds which are more than any other Troy-Bilt string trimmer, but it comes with a strap so that you can carry it easily. If the string trimmer cannot finish the job alone, you can rely on brush cutter power that is built-in and that is specifically made in order to cut brush and weeds. With an adjustable handle, you can get easier control and you can set the different angle and choose the primary hand, from left to right, or from right to left. You can add different attachment and to turn this amazing trimmer into a bunch of different tools. It can become edger, pole saw, or blower that works through the engine. When you decide to buy it, you will get 2-years warranty. 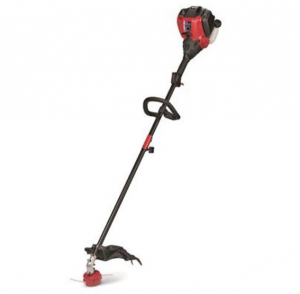 We have presented you best Troy-Bilt string trimmers that are available on the market. Troy-Bilt is an indispensable part of every household and they proved through eighty years of existence that they are not going to stop making high-quality string trimmers for garden enthusiasts.